Truckin' Teutonic Tuesday: Who you're calling Gogo? Ein “Kleintransporter”. That’s how the Germans call this. A Goggomobil TS 250. 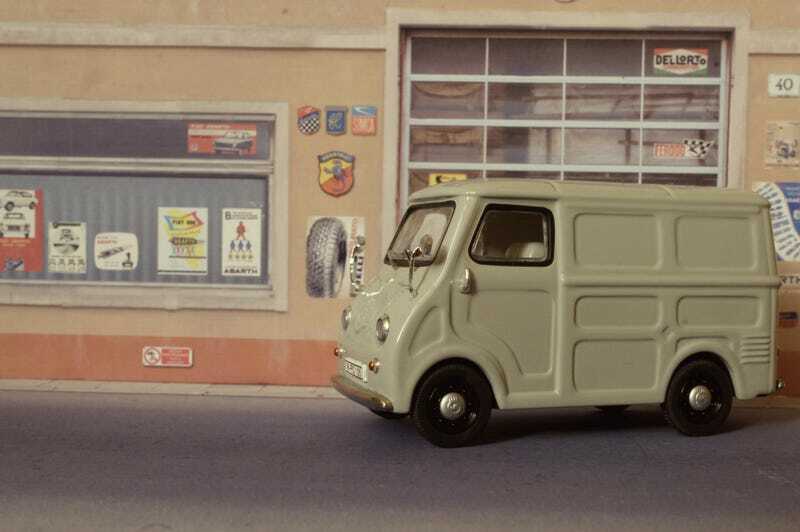 It came by on Oppositelock at least once in a piece by Microcar authority Jonee and it’s one of the most adorable LKW’s ever. “LKW” you ask? LAST KRAFT WAGEN! Because just like Japan with it’s Kei-car formula the Micro-car was a thing in Europe as well. And if you want to catch up on this I highly suggest to check out Jonee’s pieces on Oppo about this matter. He has tagged them with ‘Microcar’ so they’re easy to find. So where did this Goggomobil come from? It was a sub-brand of Hans Glas GmbH. Hans Glas’ creations would become mainly stylish, well engineered cars, but the Goggo was his first attempt with a small saloon, a small coupe and this little Van. Later on he would come up with the epic GT and even a V8, just before BMW took over the entire Dingolfing operation. But Glas’ later work, like the GT above, is for another Teutonic Tuesday. I hope as I still don’t have a decent 1/43 of a GT. The name ‘Goggomobil’ derived from the nick-name of one of Hans’ sons, “Goggi”. Which, according to some sites, is supposed to mean “rooster” in Bavarian dialect. And the Goggomobils were quite a dynamic drive with their advanced welded-steel platform chassis featuring swing axles with coil springs at both the rear and the front. The toy-like transporter though, also called the “mailbox-on-wheels” (more on that later! ), was in sharp contrast to the curvaceous sedan and sleek, stylish coupe. Glas had opted for a fully-utilitarian van, using the absolute maximum of load-carrying volume possible on such a short wheelbase. It used the exact same chassis as the other two models used. And as with these other two came the same three different 2-stroke twin engines: either 250, 300 or 400cc. Mounted in it’s back. At least 14 hp. Going all the way to 20 for that 400cc! It was capable of transporting 250 kilograms and a volume of 1600 liters, quite remarkable for such a small sized vehicle. It was very cheap due to an absolute minimum of taxes and running costs. The doors were of the sliding kind, enabling the driver to enter and exit quickly by leaving the doors latched open for repeated pickups and deliveries. And making it easier to work in narrow or cramped locations. And that’s where it biggest customer fell for. Of the 3677 units produced, over 2000 ended up being yellow and driving for the ‘Deutsche Bundespost’, the German Postal Services. It’s even said the interest of the D.B. was the main reason for Glas to develop the thing in the first place. The debossings on it’s side panels have one purpose only, of course: stifness! I can imagine this being quite problematic when restoring one though... It could even be ordered as a Pick-up, I may want that one as well in 1/43. That way I’ll finally end up with three trucks in my collection, some of you may remind my Hanomag featuring in the BMW-Isetta post a little while ago. It’s probably one of the most sought-after Goggomobils as not many have survived their years of hard labour. This 1/43 model is from Premium Classixxs and can be had in all kinds of versions. Like this rather dull grey one, or like the ones of the Bundest Post, or like a service car for the Goggo-scooter. Only things that bother me of this Premium Classixxs TS250 is those rear-view mirrors. I don’t remember them looking like that and furthermore: I can’t imagine being able to see anything in these when it’s mounted like this behind it’s A-pillar. But I really like it’s friendly face. Das war es wieder. Ich bin gespannt welcher Teutonisches LKW’s euch alle zeigen können. Tschüss!! !